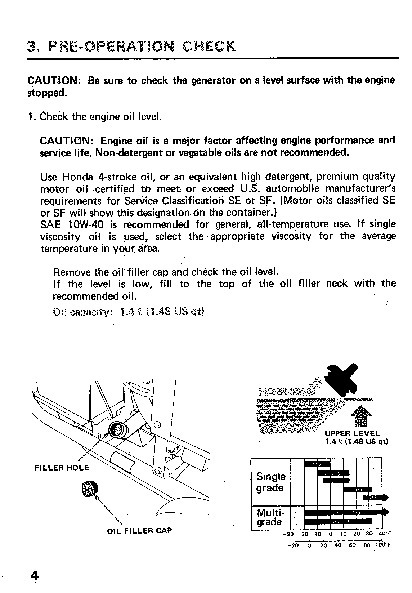 HONDA – – – – – ES6500· EL5000 OWNER’S MANUAL HONDA MOTOR CO., LTO. 1982 Thank you for purchasing a Honda generator. This manual covers operation and maintenance of the ES6500 and EL5000 generators. All information in this publication is based on the ES6500. Honda Motor Co., Ltd. reserves the right to make changes at any time without notice and without incurring any obligation. No part of this publication may be reproduced without written permission. 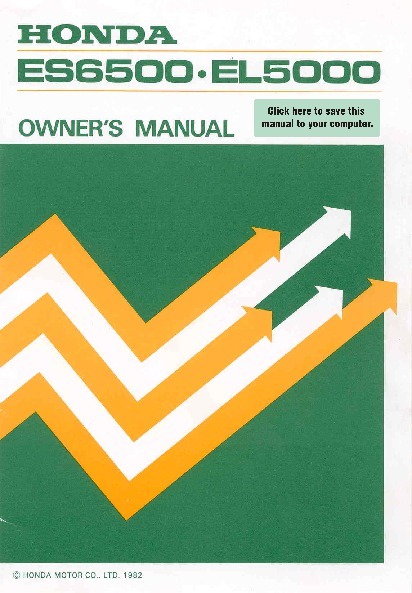 This manual should be considered a permanent part of the generator and remain with the generator when sold. Pay special attention to statements preceded by the following words: Indicates a possibility of personal injury or equipment damage if instructions are not followed. NOTE: Gives helpful information. 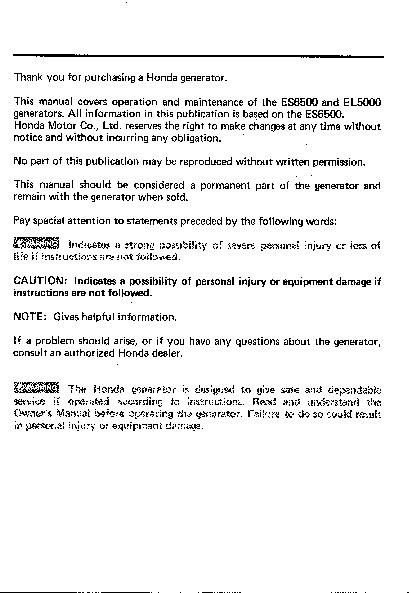 If a problem should arise, or if you have any questions about the generator, consult an authorized Honda dealer. ffid%#Wa The Honda is to safe and to instructions. 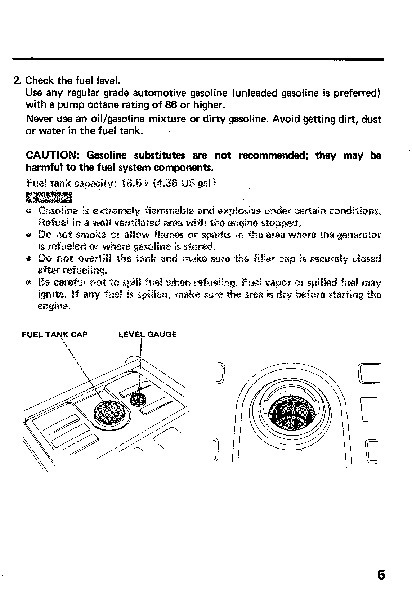 Read and service if al/ “‘E!’ ” Manual befo’e ooer–r-l (UPPER LEVEL) MIN (LOWER LEVEL) RESERVE TANK 6 4. Check the battery. 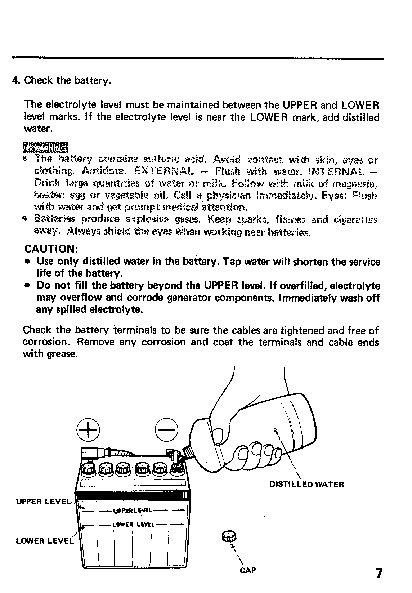 The electrolyte level must be maintained between the UPPER and LOWER level marks. 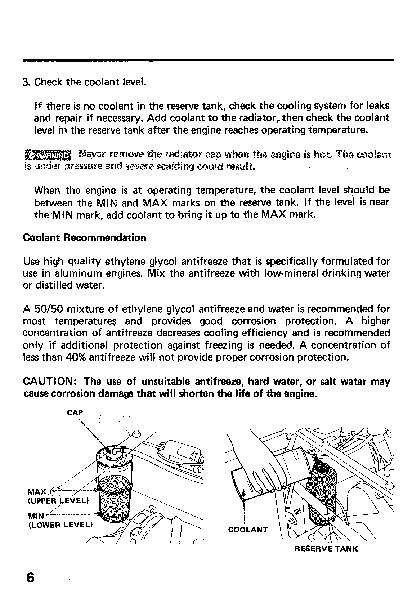 If the electrolyte level is near the LOWE R mark, add distilled water. acid. Avoid contact with eyes or clothing. with water. INTERNAL of water or milk. follow with milk of maon.,.ia. Drink large oil. Call a physician immediately. Eyes: bAate ” e!l!l or with water get prompt medical attention. produce explosive gases. Keep sparks, flames and cig,are;ttes away. Always shield the eyes when working near batteries. balcterv contains II II CAUTION: Use only distilled water in the battery. Tap water will shorten the service life of the battery. Do not fill the battery beyond the UPPER level. 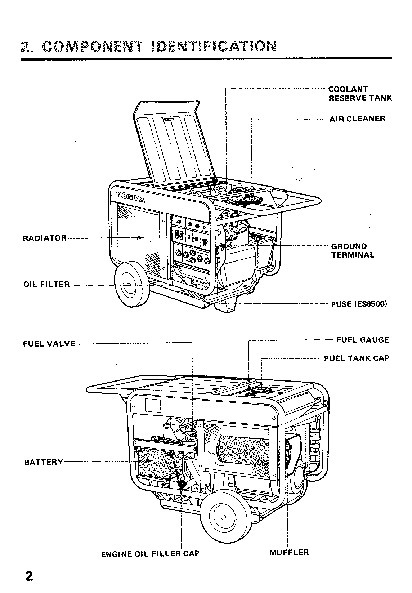 If overfilled, electrolyte may overflow and corrode generator components. Immediately wash off any spilled electrolyte. Check the battery terminals to be sure the cables are tightened and free of corrosion. Remove any corrosion and coat the terminals and cable ends with grease. DISTILLED WATER I UPPER LEVEL ‘II “Make sure that the circuit breakers are OFF. 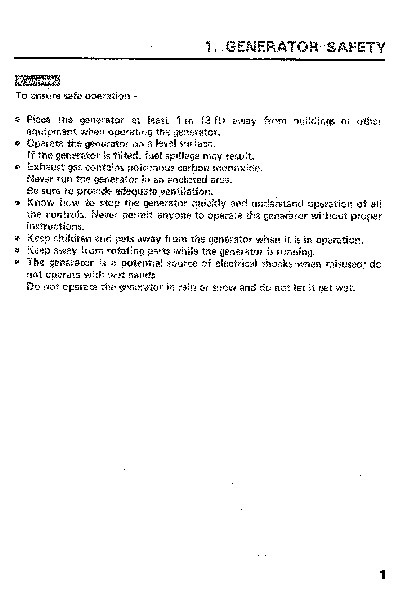 The generator may be hard to start if a load is connected. CIRCUIT BREAKERS , u 4. Make sure the auto-throttle switch is off, or more time will be required for warm up. 9 5. Turn the engine switch to START and hold it there until the engine starts. Do not use the electric starter for more than 5 seconds at a time. 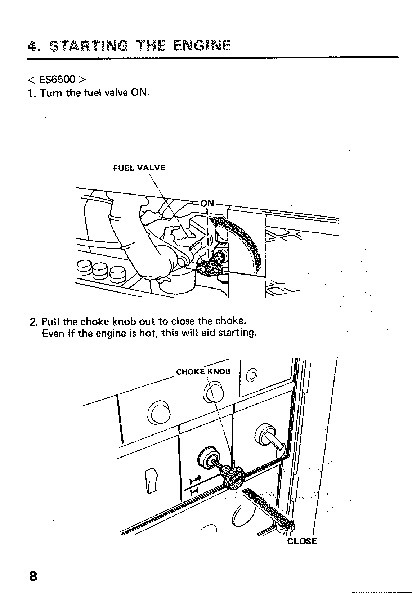 If the engine fails to start, release the switch and wait 10 seconds before operating the starter again. NOTE: · When the speed of the starter motor drops after a period of time, it is an indication that the battery should be recharged. /> ENGINE SWITCH NOTE: It is normal for the oil lamp to remain lit during starting. If the oil level is OK, the oil lamp will go off when the engine is running. If the oil level is low, the oil lamp will stay on and the engine will not run.. –. 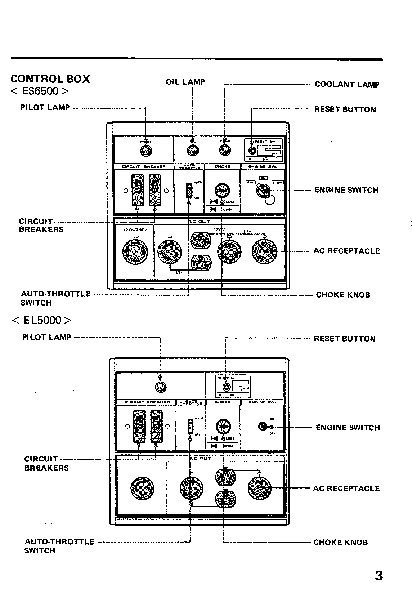 PILOT LAMP 0 (() C [ 10 o a 6. After the engine starts, let the engine switch return to ON. ENGINE SWITCH 7. Push the choke knob in to open as the engine starts. CHOKE KNOB j J OPEN III 11 8. Warm up the engine for 2-3 minutes. Turn the auto-throttle switch to AUTO after the engine has warmed up. AUTO·THROTTLE SWITCH lJ 12 < EL5000> 1. Turn the fuel valve ON. FUEL VALVE 2. Pull the choke knob out to close the choke. Even if the engine is hot, this will aid starting. CHOKE KNOB 13 3. Make sure the auto-throttle switch is off, or more time will be required for warm up. () f) AUTO·THROTTLE SWITCH o 4. Turn the engine switch on. 14 5. Pull the starter grip until compression is felt, then pull briskly. NOTE: Do not allow the starter grip to snap back. Return it slowly by hand. STARTER GRIP 6. Push the choke knob in to open the choke after the engine starts. CHOKE KNOB j 15 7. Warm up the engine for 2-3 minutes. Turn the auto-throttle switch to AUTO after the engine has warmed up. AUTO·THROTTLE SWITCH i) o o 16 5. laWI:lfiidri To electrical shock from should be grounded. Connect a length of terminal and the ground source. ERATOR generator wire between the ground CAUTION: Limit operation requiring maximum power (ES6500: 6.5 KVA, EL5000: 5.0 KVA) to 30 minutes. For continuous operation, do not exceed the rated power of 6.0 KVA (ES6500), 5.0 KVA (EL5000). In either case, the total wattage of all appliances connected must be considered. · Connections for standby power to household circuits must be made bya qualified electrician and must comply with all applicable laws and electrical codes.